New Farakka Express accident near Raebareli: At least seven passengers died and 21 others were injured after 9 coaches of Malda Town-Delhi New Farakka Express derailed in Raebareli in Uttar Pradesh at around 6 am today. 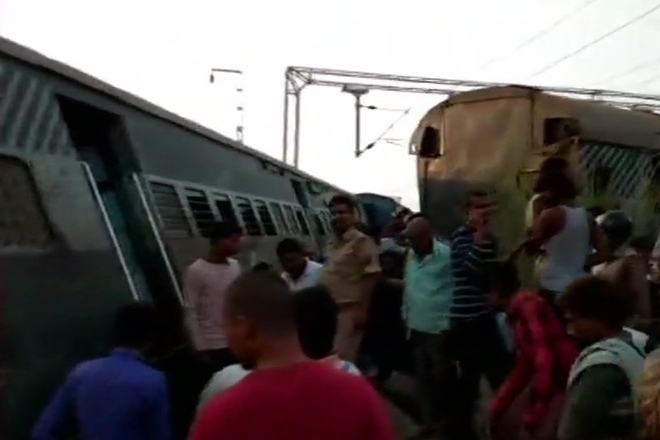 New Farakka Express derails: At least seven passengers died and 21 others were injured after 9 coaches of Malda Town-Delhi New Farakka Express derailed in Raebareli in Uttar Pradesh today morning. According to news agency ANI, the mishap happened near Harchandpur railway station of the Northern Zone at 06:05 am. Railways Minister Piyush Goyal has directed the officials to effectively undertake relief and rescue operations. He has also ordered an inquiry by Commission of Railway Safety, Northern Circle. Meanwhile, movement of traffic on the route has been halted. According to DRM Northern Railways, it may take 24 to 36 hours to clear the route. He informed that all 21 passengers have been admitted to the district hospital Raebareli and special train is being arranged by the railways. Chief Minister Yogi Adityanath has also taken note of the accident and announced a compensation amount of Rs 2 lakh for the kin of deceased and Rs 50,000 for the injured passengers. 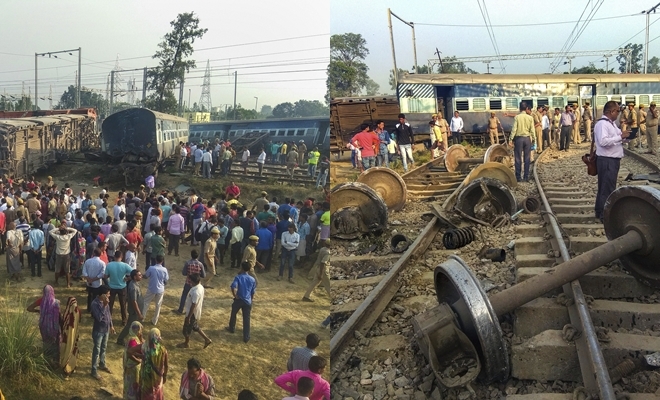 9 coaches and the engine of Malda Town-Delhi New Farakka Express derailed in Raebareli today morning. Prime Minister Narendra Modi has condoled the loss of lives in New Farakka Express derailment in Raebareli. 'Anguished by the loss of lives due to a rail accident in Rae Bareli. Condolences to the bereaved families and I pray that the injured recover quickly,' the PMO tweeted quoting Modi. Meanwhile, Railways Minister Piyush Goyal has announces Rs 5 lakh ex-gratia for the next of the kin of the deceased. Also, Rs 1 lakh compensation will be given to those who suffered serious injuries in the mishap and Rs 50,000 for those with minor injuries. According the the NRF, while 6 passengers died at the accident site, 1 was declared dead at the hospital. A total of 27 passengers have been admitted to the hospital for medial relief. Sanjeev Kumar, Team Commander NDRF, informed that there is no live victim trapped now. Drones and long-range cameras are being used by the officials involved in the rescue and relief operation to monitor the situation at the accident site of New Farakka Express in Raebareli. According to DRM Northern Railways, it may take around 24-36 hours for the completion of clearance operation on the route. He informed that alll passengers have been evacuated. DRM Northern Railways has arrived at the spot. He confirmed that 7 passengers are dead and 21 others are injured. "Injured persons are district hospital in Raebareli. Special train is being arranged for other passengers." Resue and relief operations are underway at the accident site. NDRF officials, district administration officials are present on site. ANI reported that 7 passengers have lost their lives in the derailment. Railways Minister Piyush Goyal has taken note of the incident and directed the officials to effectively undertake relief and rescue operation. He has also asked them to provide best possible medical help to the injured passengers. Meanwhile, Goyal informed that an inquiry has been ordered into the accident. The inquiry will be conducted by Commission of Railway Safety, Northern Circle. Uttar Pradesh CM Yogi Adityanath has announced Rs 2 lakh ex-gratia to the next of the kin of the deceased and Rs 50,000 compensation for injured ones. NDRF teams from Lucknow and Varanasi have reached the spot. Relief and rescue operations are currenly underway. So far, 6 passengers have died and around 20 others are injured. The mishap happened 50 m from Harchandpur railway station at around 6:05 am. Meanwhile, a PTI report said that Chairman Railway Board Ashwani Lohani was on his way to the accident site in Raebareli. A PTI report said that Railway Board Chairman Ashwani Lohani was on his way to the accident site in Raebareli. Uttar Pradesh Chief Minister Yogi Adityanath has also taken note of the incident and directed the Raebareli DM, SP, health authorities and NDRF to provide all possible assistance to relief and rescue operations. Meanwhile, Railways Minister Piyush Goyal has expressed condolences for the deceased and directed officials to effectively undertake the relief and rescue operation and provide best possible medical help to the injured persons. Besides, Goyal has also ordered an inquiry in the accident. The probe will be done by Commission of Railway Safety, Northern Circle.